In Rashaad Newsome’s “Running,” a vocal tradition reaches expressive new heights and plumbs emotional depths. 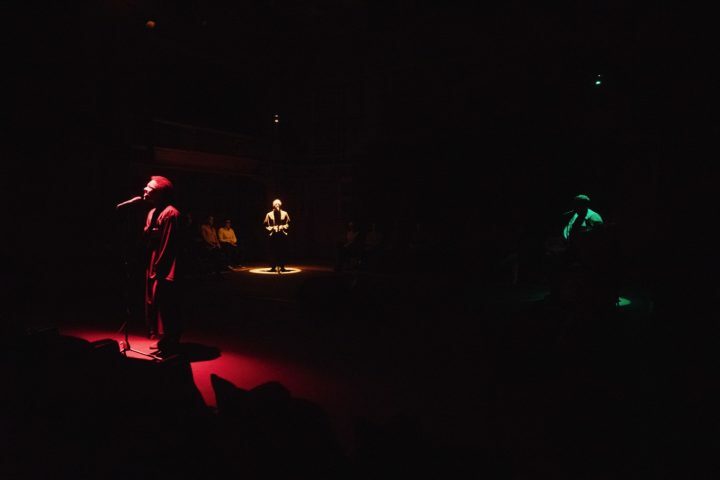 The email I received promised a performance of “vocal runs” at the Park Avenue Armory that would evoke “an abstract portrait of soul,” but what Rashaad Newsome was trying to do with his piece “Running,” I think, was nudge the audience towards transcendence. You might not know what vocal runs are. I didn’t. I did some research and found I had been hearing them most of my adult life — when I listened to R&B and gospel music. It’s described as an athletic vocal embellishment of a melody, rhythm or chord. Contemporary singers often use this vocal ornamentation to show off their skills, to prove their talent. (You can hear an exquisitely lovely example on Stevie Wonder’s “Don’t You Worry ’bout A Thing.”) Significantly, his rendition shows that this mode of singing is not just about demonstrating virtuosity. It’s about leaving the structure of the song behind to venture out, searching for something with rigor and sometimes desperation — out loud. I start off in the dark with the piece, wearing a blindfold as required and being led to my seat by an usher who placed my hands on her shoulders and told me to follow her. I sit. Eventually, the talking voices quiet and I’m told I can remove the blindfold. It’s almost jet black. A red light appears high above a man dressed in a dark robe like a choir singer. He starts singing, he runs up and around a scale in slow meandering fashion, crooning, aching, sometimes yelling. Over the next hour red, green and yellow lights wink on and off over the three vocalists (Kyron El, Aaron Marcellus, and Devin Michael). They seek something that might be in the room, in or around themselves, maybe in us in the audience. They search with some feeling of celebration and some anguish. I don’t know what they are looking for, but I can’t help but hold onto them as I also navigate the dark. You might not know what transcendence is. I thought I did. My tendency is to imagine a state of psychically taking leave of my physical body as a kind of motion upwards, towards what might be a heaven. But this experience was more like sinking beneath successive swells of sound until I was interred underneath them, to discover I wasn’t going to drown but could breathe more deeply down there. Rashaad Newsome‘s premiere of Running, part of the Artists Studio program, took place at the Park Avenue Armory (643 Park Avenue, Upper East Side, Manhattan) on November 7.